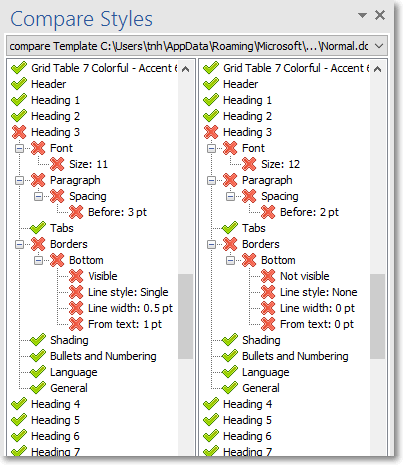 The Compare Styles tool compares the settings of all Styles in one document with those in another document. Most organisations have one or more documents containing a master set of styles that all other documents are supposed to adhere to. This tool provides an easy way to check that a document is following the corporate guidelines by comparing it with the chosen master set of styles. The result of the comparison is a two-column list of the differences. At the detail level, only points of difference are listed. In the image below we can see that Heading 3 has been adjusted to a font size of 11 points from the master setting of 12 points. The name of the font is not listed – so we know that the font name was not changed. Likewise, the Paragraph Spacing Before was changed but because it isn’t listed we know that the Paragraph Spacing After was not changed. The Paragraph Indentation, Alignment, Widow / Orphan etc settings are not shown so these must also match perfectly.